Sungai Lembing food court is located opposite Country View Inn. It provides a wide range of tasty food for locals and tourists. There are many delicacies available in country town Sungai Lembing. One of the local delights is the tomato sauce noodles. 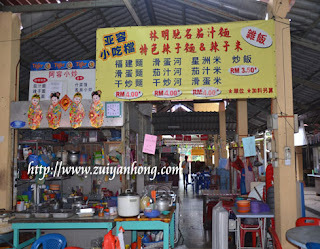 During our trip to Sungai Lembing, we drop in this food stall to taste the tomato sauce noodles. The taste of the tomato sauce noodles is just nice. When you are around in Sungai Lembing, you can have a try the tomato sauce noodles. Beyond the tomato sauce noodles, this food stall also offers fried rice, fried noodles, spicy noodles, spicy bee hoon, Fujian noodles, fried kway teow, fried egg noddles, fried egg bee hoon, Sin Chew bee hoon, fried egg kway teow, tomato sauce noodles, tomato sauce bee hoon and tomato sauce kway teow. Other stalls supplies shan shui doufu and shan shui stuffed doufu. The coffee stalls sell toast, soft-boiled eggs, hot and cold drinks. Sungai Lembing is not flourishing as before. Most of the food court customers are as old as me.